Is there any alternative for the orange safety cones? 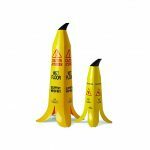 Richard from Texas is asking us for a more noticeable safety cone, and we found the banana safety cone, which their creators claim it s 22 times more noticeable than the regular cone. Unique design draws more attention and delivers a clear “don’t slip” warning message. And they are still stackable for easy storage and they’re hilarious. Their material is really good too, so it could last longer than a regular cone. But, has a huge but! The price. A three package bananas cone cost around $110. That is $36 per each. You can buy a pack of six for a regular safety cone for the price of one. Unless you believe that safety really has no cost, avoid these cones. Buy your cone here! This entry was posted in Anything else and tagged banana cone, banana orange, banana peel, banana safety cone, orange, pool cone, safety cone, slipper cone, yellow cone on July 14, 2017 by WhereCanWeBuy.